I got a set of Italian stamps from the last Papertey release that I put to good use. 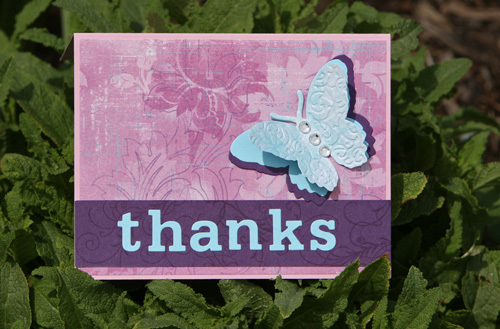 This is a thank you card I made for some special people! 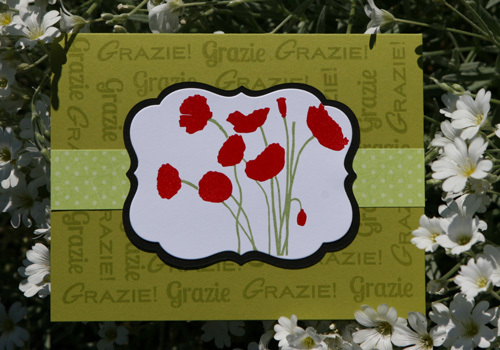 I used red embossing powder and ink on the poppies. 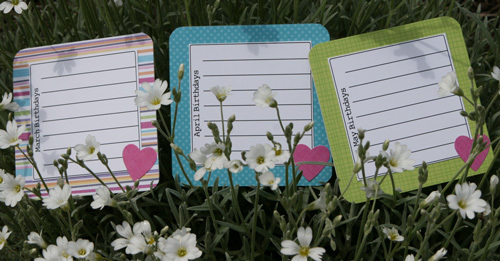 I saw these adorable magnetic birthday calendars on Lisa Johnson's blog. I made them for Mother's Day gifts this year. Here is a small sample of them. This set has a pink one as well that isn't shown (same color as the hearts shown). I found the four bright and fun papers at Hobby Lobby and are made by The Paper Studio. 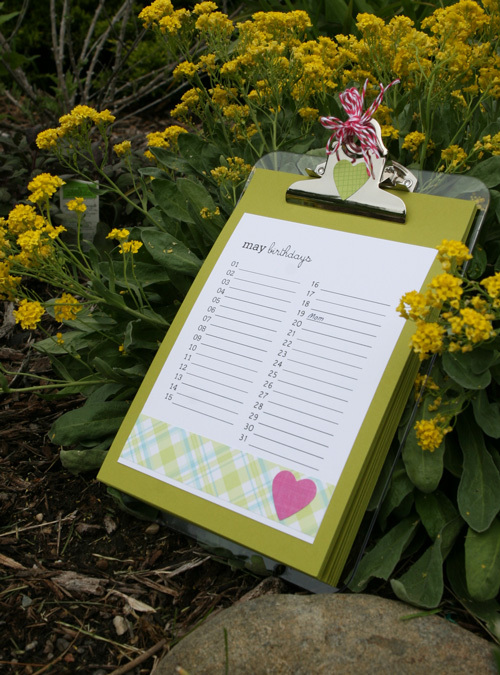 On Lisa's blog, you can get instructions and the calendars to print. I printed the calendars on white cardstock and cut them out. It takes two sheets of white (or whatever color you choose). The whole thing is mounted on paper coasters (I purchased mine at papertreyink.com) with magnets attached to the back so you can stick them to your fridge. So clever! 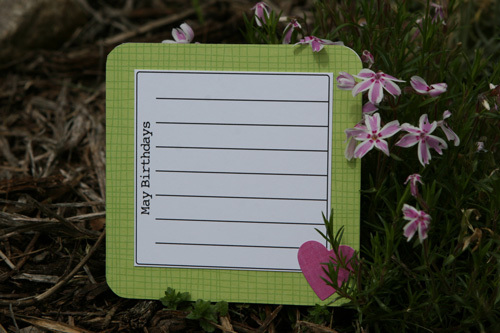 So, if you are in need of some cute gifts to have on hand, check these out on Lisa's blog! I had a hard time learning to use the ink blending tool to antique the edges of the die cuts and I messed up several before I got the hang of it. After the fact, I found this great youtube video from Two Peas In A Bucket that shows how to use it. So hopefully that will help the rest of you out there who haven't used that tool yet. I didn't use the green ink in the antiquing process like on the Make-It-Monday video. I tried it but I didn't like how it looked. 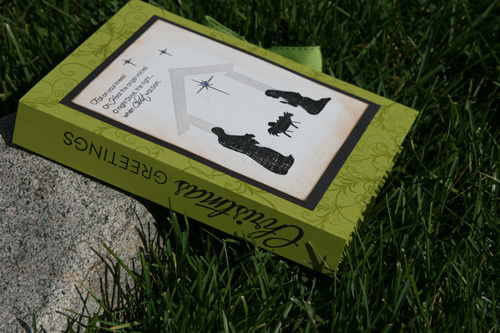 I think it didn't look good because I was mounting it on green cardstock and it really pulled the green out of the die cut. So I only used the tea dye and walnut stain. I also lined up my sentiments a little differently on the die cuts because I wanted to be able to read more of the words in the background than in the Make-It-Monday versions. I also had a frustrating time with the inks. I ordered Smokey Shadow ink from PTI to so I could stamp the silhouettes to match the cardstock strip that runs under the die cuts. However, their ink dries to a dark brown...not a light black/deep gray tone. There is even a discussion about it on the forum. So I had to find something else. I tried black pigment ink from Colorbox but it took FOREVER to get good coverage on the stamp and, even if I heat set the ink, it still would smudge on my finished product. I had to trash several finished die cuts because of that. I finally found Ranger's Pitch Black pigment ink that didn't smear after it was dried, and gave a quick good coverage on the stamp. 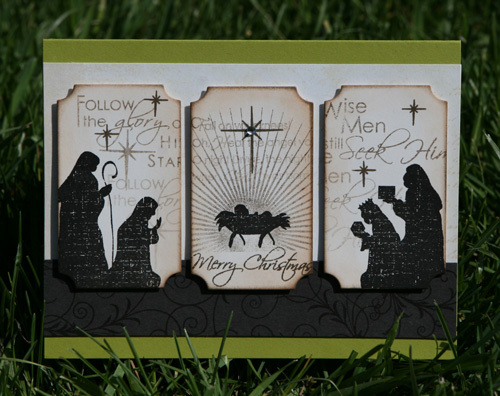 The "shade" of black also went well with the smokey shadow cardstock strip. Here is the All Boxed up "box" I made from the template. It really made my project something special and I'll be using it many more times. 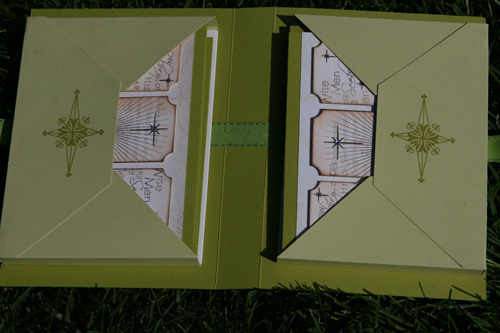 It packages any card set to beautifully. 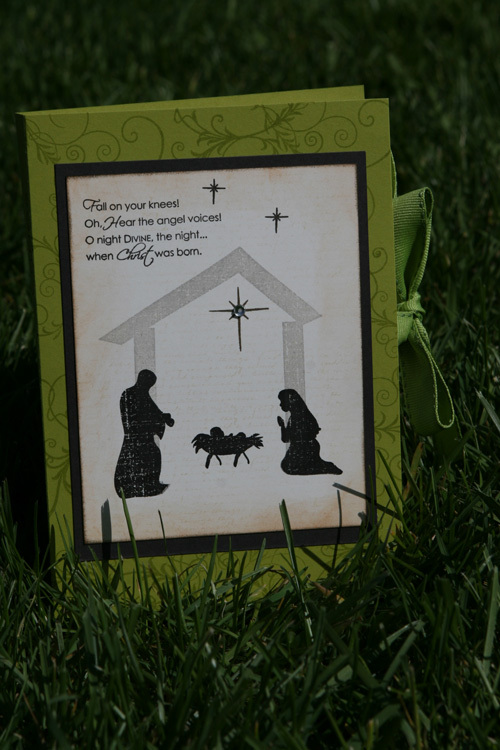 The stamped scene on the front was heavily influenced by this lovely nativity card stamped on craft card stock by Nichole Heady. Here is the box all closed up and tied shut with the ribbon. I made this card for a special family.